Flying into Brenham or Lockhart airport hungry? "Ground-pounding" happens to be pilot slang that refers to a pilot or non-pilot who drives to a destination. But, no matter how you get there, plan your next trip to these two retro airport diners that serve great, classic comfort food and drinks. Aside from the incredible food and atmosphere, the "pickle on the bun" is that you'll get to see all kinds of aircraft flying in and out while enjoying a visit with the pilots. And don't worry; I've got some great classic recipes for y'all that are sure to bring back memories. Many writers (like myself) have day jobs. Mine happens to be managing Martin & Martin Aviation at the Lockhart Municipal Airport where I learned to fly and met my husband, Larry, who is also a pilot. Some of our favorite times to fly are spring and summer and, I don't know about you, but the warmer weather always reminds me of my childhood days. So, how about a trip back in time and, even though we can drive to these destinations, I thought y'all might enjoy taking a "virtual flight" to a couple of old-fashioned airport diners. We'll start out in a two-seater 1946 Aeronca Champ (tail-dragger), which is the right era aircraft to fly when heading to the 1940s Airport Diner and Hangar Hotel on the grounds of the Gillespie County Airport in Fredericksburg, Texas. Located about an hour west of Austin and north of San Antonio, the Airport Diner is designed in the manner of railcar diners with a curved birch-wood ceiling, stainless steel walls and terrazzo floors. The main counter is lined with soda-fountain stools, but let's sit in a booth and look out the large windows at all the aircraft. The menu offers breakfast, lunch and dinner, and weekend Blue Plate Specials, and you can order food like eggs, pancakes, Bomber Burgers, sandwiches, onion rings, salads, and some really great desserts like peach cobbler or banana splits with ice cream especially made in Fredericksburg for the diner. For the little buckaroos, there's the Rosie the Riveter grilled cheese sandwich, Kamikaze dogs, Patton's PB&J sandwich, and Nimitz chicken nuggets. Plus, if you're too full to go home, you can stay overnight at the Hangar Hotel. This hotel resembles an old-fashioned wooden hangar with an outdoor search light, vintage water tower and rotating beacon, and the interior is filled with custom-made, World War II-era furniture that makes you feel like you're somewhere in the South Pacific. 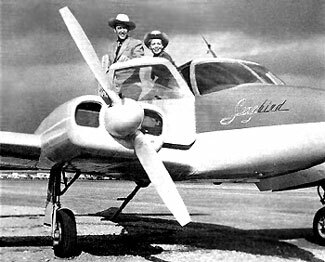 Now, if you're ready to move on, we'll head a little more into the future of the 1950s, but let's switch aircraft first and take a 1950s Cessna 310. This plane is the one that Larry likes to fly, not just because it's a classic twin-engine, but also because it's the same kind of aircraft that was used in the '50s TV series Sky King. And, if we're going to take the 310, I want to play the role of Penny! For those of you who don't know about Sky King, the theme was a loosely-based western always involving a rancher named Sky King, "America's Favorite Flying Cowboy', who helps keep a nearby military base safe, as well as assisting the local sheriff in catching the bad guys. Sky's niece, Penny, is also a multi-engine rated pilot and an air racer to boot. So, let's load up and take off, "making a sharp bank with engines roaring into the clear blue of the western sky"! This time we're headed east to a location between Austin and Houston to The Southern Flyer Diner, which is based at the Brenham Municipal Airport. The owners are a husband and wife team, Jack and Janet Hess, who are also pilots. Their restaurant is said to be a slice of Americana because of its 1950s theme with its checkerboard floor, corner jukebox and waitresses in poodle skirts. The food served up is good old-fashioned burgers, fries, onion rings, fried pickles, apple pie and mocha-cola cake. Best of all they have made-right-every-time malts and shakes prepared with (of course) Bluebell ice cream made in Brenham, which happens to be the No. 1 best selling ice cream in Texas and third best selling in the U.S. Jack and Janet say that their customers are 50 percent pilots and 50 percent non-pilots. And, even though they serve up the usual burger-stand type fare, all of the fried foods are cooked in zero trans-fat Canola oil. Now, you can ask and you can plead, but like all good chefs, some of their more popular recipes, like their catfish batter and the sauce for their Brenham Wings are secret, so you'll just have to be content with enjoying the meal and coming back for more. And speaking of coming back for more, let's grab a seat on the back deck where we'll have a perfect view of the runway and the planes flying in – just another reason to return. But you don't have to take my word for it; this diner has consecutively received the "Best of the Best - $100 Hamburger Award" from 2006 to 2009. And by the way, "$100 Dollar Hamburger" is just another phrase jokingly used by pilots because of the high cost of flying. We say it costs us $95 to fly for a $5 meal. Well, looks like it's time to go back to the future -- our present -- and I bet you're hungry. But don't worry because I've plated up three classic to-go recipes for you to take home: the Club Sandwich, which began using three pieces of bread in the '40s, some classic-made Twice-Fried French Fries, and the Black Cow Milk Shake or Malt. I've added a little Texas twist to the sandwich recipe by using Texas Toast, and Texas' own Bluebell Ice Cream to your shake or malt. So, get 'em while they're hot (or cold), and then sit back and think about the day you just had flying across those beautiful, blue Texas skies! Line up the three pieces of Texas Toast and spread 1 tablespoon of mayonnaise on each. Now, place two lettuce leaves over the first piece of mayonnaise-covered toast, then top with two tomato slices, then salt and pepper. Then top the tomatoes with two pieces of bacon followed by two slices of turkey, and salt and pepper again. Follow the same instructions with the second piece of Texas Toast and then set this on top of the first layered toast. Take your last piece of toast and place it, mayo-side down, on top of the sandwich. Finally, to keep it all together, place a toothpick about 1 to 1-1/2 inches from the edge of each corner of the sandwich and cut diagonally into four triangle-shaped pieces. Serve with a pickle on the side. Makes 1 sandwich. Wash potatoes and cut into 1/4-inch wide and 3-inch long sticks. Blot the potato sticks with a paper towel to remove excess moisture and divide the potatoes into cup-size batches. Pour oil about halfway deep into a deep fryer and heat to 325°F. Place the first cupful of potatoes into the heated oil and fry until lightly brown, about 4 or 5 minutes. Remove the potatoes and place on paper towels to drain, and then repeat the process until all of the potatoes have been fried. Raise the oil temperature to 375°F, and place a cupful of fried potatoes into the oil, frying them until they're golden brown and crisp, about 1or 2 minutes. Remove the fries and again place them on paper towels to drain and continue on until the remaining fries are all cooked. Sprinkle with salt and serve. For the milk shake, place all ingredients except the malted milk powder into a blender and blend until thick and creamy. If using chocolate ice cream, adding the chocolate syrup creates an even richer flavor. For malts, place all ingredients including the malted milk powder into a blender and blend until thick and creamy. Makes 1 large or 2 small drinks.